Building your new home is an exciting time in your life. Tiling is closely associated with commercial and residential projects. We work based on the requirements of the customer step by step from bricks to blocks. Our tiles man works on laying tiles in the desired pattern. It may be mosaic, ceramics and tiles for swimming pools, houses or outside installation to provide decorative finish. We at London West Builders, work professionally to maintain the relationship between the nature of tiles and quality of the product. We have experienced tillers who are outstanding and who can interpret and measure tiles, removes any existing covering, lay all the tiles in desired patterns and also do artistic works to a high standard. They have interpersonal skills, self-management, good communication, accurate, creative, responsibility, problem solving and innovative ideas. Throughout from planning, scheduling and processing they work sincerely with precision, accuracy, and every step to achieve an excellent finish. We have been providing professional tile installations for your new house floors, bathroom, kitchen and pool. We have the capability to turn your vision into reality. 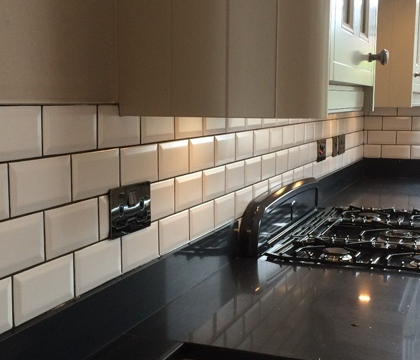 We have a vast experience in tiling field and get the job done right on time. We can install tiles for new floor with custom patterns and motifs. We get the right products based on the project and client needs. We will provide you with a finished look and you will love it. We will always deliver what we promise at a competitive price. We give you the best quality work to suit your new home.